Tampa, Florida Mayor Bob Buckhorn likes to say that when he moved here in 1980, only 600 people lived downtown—300 of them at the old Morgan Street jail. No wonder. Downtown Tampa in 1980 had been in decline for decades. A century before, early leaders had charted its future as a deep-water port for moving cargo: phosphate mined in Central Florida, citrus grown along the Gulf Coast and cigars rolled in brick factories crowded with Cuban and Italian immigrants. To step onto the docks before World War II was to enter a realm of railyards, warehouses and oil tanks. The prettiest building in town was (and arguably still is) a minaret-topped grand hotel (now the University of Tampa) that a 19th-century rail baron built on the far bank of the Hillsborough River. But until the early 1960s, that gem looked back across the river at a meat-packing plant teeming with big, brazen rats. By 1980, Tampa’s waterfront was an industrial dead zone, some warehouses empty, others demolished and replaced by vacant lots. The city’s streetcars, which once carried 24 million passengers a year, were long gone, muscled aside by a car-centric culture that helped make the Tampa Bay area the second deadliest metro in the country in which to walk or ride a bike. Downtown retailers had closed or decamped for the suburbs. There was no way to walk along the river, literally no path from the office buildings to the waterfront, and little open space. One of the only city parks near the river was fenced and padlocked to stop vagrants from bathing in its fresh-water spring. 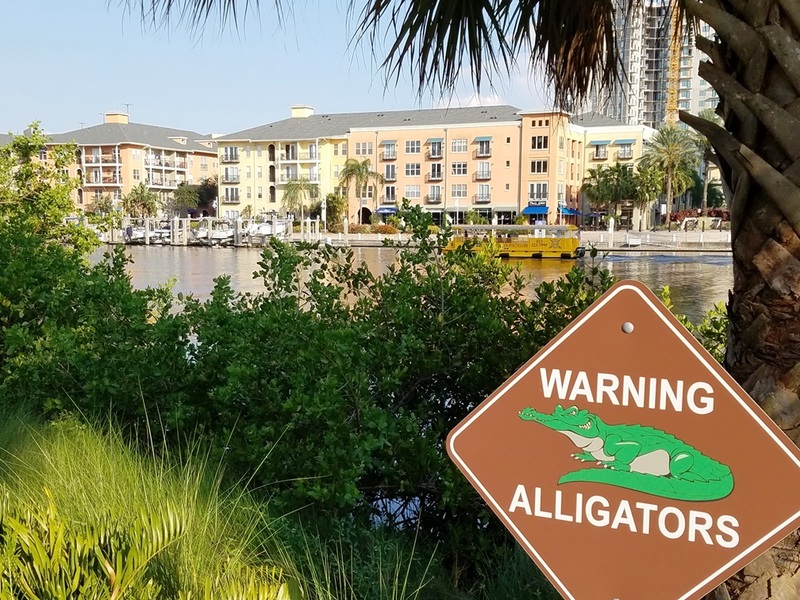 “We had this river running right through the heart of the city, and everybody had turned their back on it,” says Sandy Freedman, Tampa’s mayor from 1986 to 1995, when things started to change in a big way. 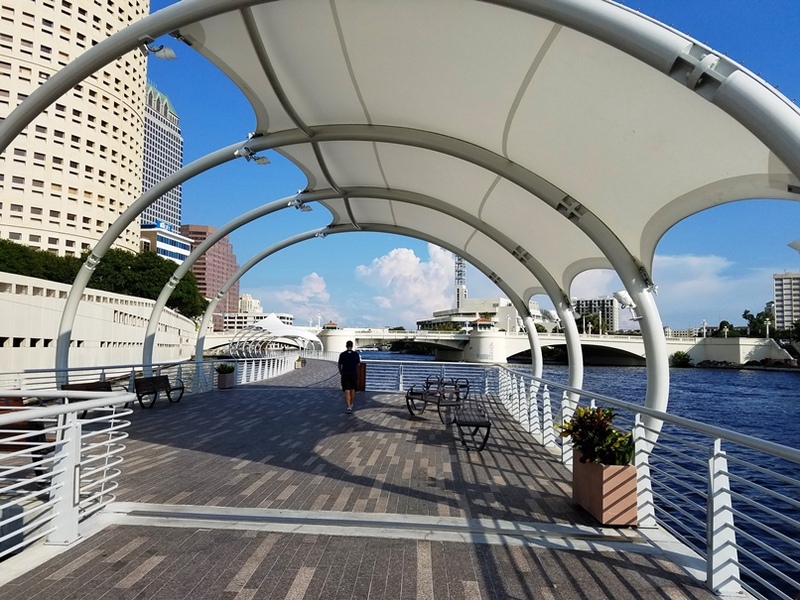 Today Tampa has reinvented its downtown step by gritty step, but it hasn’t been cheap. 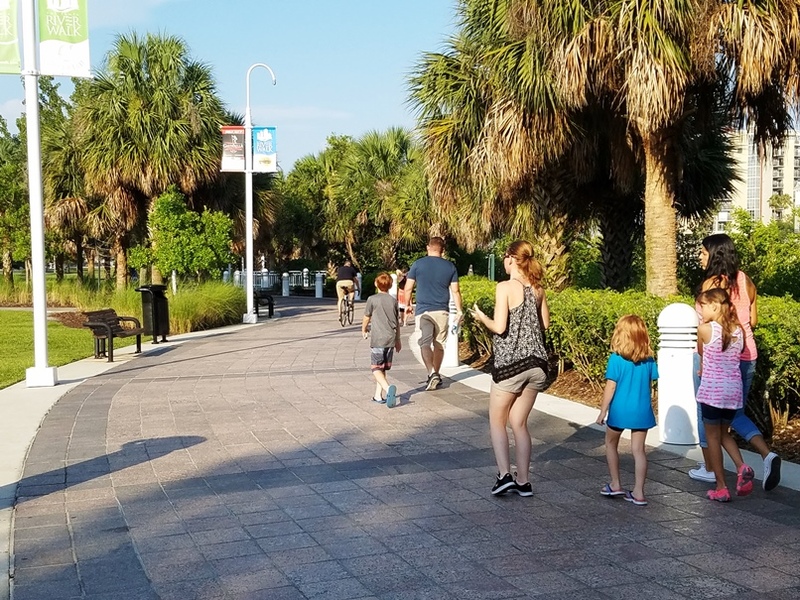 Over the past 30 years, City Hall and the government of Hillsborough County have invested more than half a billion dollars in projects to activate the waterfront. This was Tampa’s Hail Mary pass—a multi-front push to transform a purely industrial zone into a tourist-friendly amenity and, eventually, a place to live. The 2.5-mile Riverwalk strings all this revitalization together. 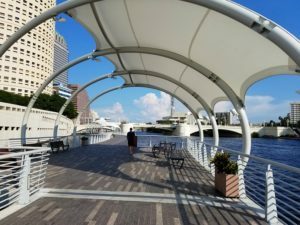 It took six mayors and 40 years, but the RiverWalk has opened up public access to the waterfront, connected the big public projects, and led to something new in downtown Tampa: a plethora of pedestrians and bicyclists–shoppers, tourists, and downtown residents–all enjoying the beautiful, long-ignored Hillsborough River. 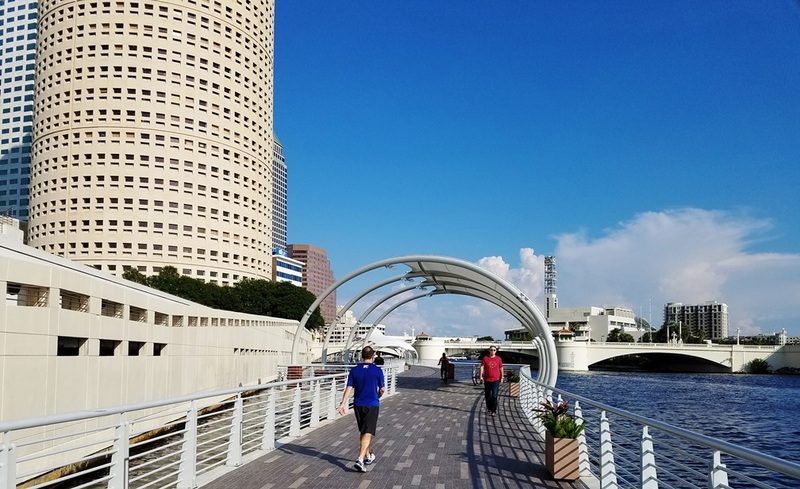 Note from Storm: As a former long-term resident of the Tampa Bay area, I’m delighted that Tampa downtown revitalization efforts are finally paying off. But I think they did it backwards: completing the RiverWalk should probably have been the first element of their strategy. Reconnecting the downtown to the river in such a grand manner would have inspired tremendous confidence in the downtown’s future, attracting private investment far sooner. Instead, they never had a real strategy and comprehensive renewal process. As a result, they went through two decades of stop-start redevelopment, leaving a string of failed projects along the way. Each project was done in isolation, and was usually dead or dying by the time the next project started (such as Harbor Island). The lovely new convention center was built, but almost went out of business due to a lack of nearby hotel capacity (since remedied). 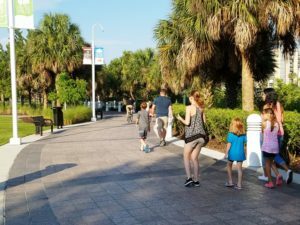 The ambitious Channelside waterfront redevelopment thrived for a while, but went into decline, in part because the new trolley serving it wasn’t free, and wasn’t frequent enough. A downtown pedestrian mall similarly was vibrant while it was new, and the went into decline, mostly due to a paucity of downtown residents. A Riverwalk would also have attracted downtown residents and tourists (shoppers), providing the customers that so many bankrupted downtown retailers and restaurants needed in those days. I know they’d probably say “but we didn’t have the money in those days!“. That’s the universal excuse for bad planning. The key is to find the best possible strategy, and find a way to fund it. Put the pain up front, rather than spreading it over decades. Anyway, I’m glad they had the perseverance to get past those tough times. Since every revitalization effort involves a lot of learning and trial-and-error, perseverance is often the key ingredients. Feature photo by Storm Cunningham. Learn the details of this success story in this excellent Politico article by Richard Danielson.